Here is an easy, but great dessert that has a few extra touches making it special. Who knows they may think you made them scratch, because the flavor is very unique by using lavender extract! 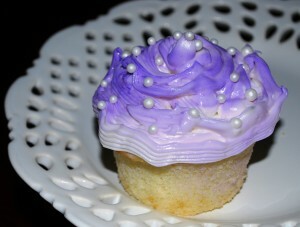 Also I made them look extra special with a color mist and pearls from Wilton. Make these for Mother’s Day, Easter, a ladies luncheon, girl’s night in, teacher appreciation or just because you want a special treat! I chose to use Duncan Hines brand cake mix, but you can use your favorite brand just make sure it is a classic white and not flavored and check the back of the box to make sure you have the ingredients it calls for. For another floral flavored cupcake try Rose Flavored Cupcakes. Makes 18 as shown, but it may vary depending on how full you fill the cups. Follow instructions on cake mix and add pure lavender extract with the wet ingredient instructions. Place in muffin tins and bake according to package directions. Cooking times will vary depending on tin. Once cupcakes are cool enough to handle and you are ready to serve, frost using a pastry bag or a quart sized Ziplock bag and cut a small hole in one corner, spray with mist and sprinkle with pearls. When spraying the cupcakes, do it over the sink because the spray will get on your hands and on your counter. The cupcakes (not decorated) can be made ahead and frozen. Thaw prior to serving and decorate right before serving. Another great option instead of frosting is to use canned whipped cream for a very light and airy treat! However, the cupcake will need to be served immediately because the whipped cream melts in about 5-10 minutes.